Love the size of this rug. Very heavy for such a flat rug. The weave pattern and color are all amazing. Very happy that it's reversible. Cleans pretty easily. Holding up well with my large dog. Only wish that it was slightly softer on bare feet. Nourison Samarkand Flatweave Reversible Olive Wool Rug - 9'9" x 13'9"
Nourison Samarkand Beige Wool Rug - 9'9" x 13'9"
This hand-woven Samarkand rug is inspired by a dramatic range of European and Persian motifs. Showcasing a bold design in shades of red, ivory, beige and pink, this rug is sure to be a wonderful addition to any room in your home. Dimensions 9 ft. 9 in. x 13 ft. 9 in. The rich colors in this rug really brightened up our room. Flat weave requires a pad underneath. The style would be appropriate in just about any room. The beige does read a little bit olive, but it still is neutral enough so that it doesn't give off a green cast. Overall, very pleased: I think this was a real bargain. Gorgeous and beautiful in our space.. Lots of Olive and Celadon undertones..
"The heading describes this rug as olive color. The details list the color as primarily green ; however, the item description list the colors as red, beige, ivory, and pink . Would you please clarify the color? Thank you." The border looks beige in the image, however it is more of a light olive. Other colors include red, yellow and the fringe is beige. 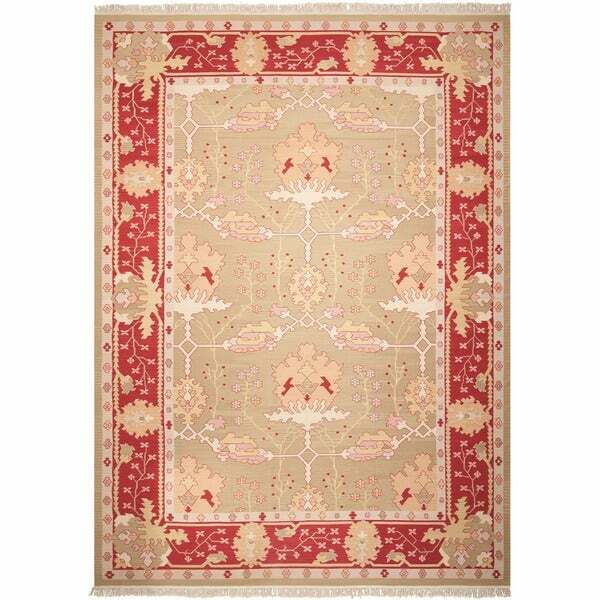 Nourison Nourmak Gold Rug - 7'10" x 9'10"